For protection from the top and the bottom, we love this wrap around squirrel baffle for its ease of use and effectiveness. For pole mounted bird feeders, Perky-Pet’s design is excellent. The long cylinder design effectively prevents squirrels from climbing up and disturbing your feeder. The discrete design of this clear baffle is great for bird watchers who don’t want their view blocked. This baffle keeps squirrels away without disturbing the natural view of your yard. Bird feeders from around the world know the struggle of squirrels. While you have set up your beautiful bird feeders for the sole purpose of attracting vast and various bird species, the squirrels have other plans. Squirrels tend to disturb the peace that you intended on when you purchased a bird feeder. The furry rodents make a mess of things, jumping all over your feeders and spilling food everywhere. They scare off the colorful birds you were hoping to see, and they are known for destroying property. Squirrel baffles are devices mounted on bird feeders or bird feeder poles and are designed to deter squirrels, whether from below or above. To keep squirrels off of your bird feeders, read on about some of our favorite baffles. Featuring a wrap-around design, the Woodlink Squirrel Baffle is a cone-shaped baffle that effectively blocks squirrels from climbing up poles and getting to your bird feeders. Easy to use, this baffle can be set up without disturbing your feeder. Using the included coupler, you need only to snap the baffle together to attach it to your bird feeder pole. The powder-coated steel will last longer and keep squirrels away. This 18-inch metal structure is also effective in keeping raccoons away. When used properly and mounted four to five feet above the ground, you will see it protects your bird seed and the birds you wish to see. The baffle can be placed either below you pole-mounted feeder or above a hanging feeder. 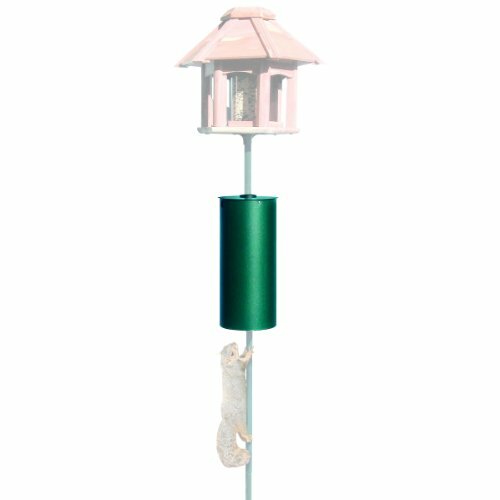 An excellent choice for those of you who own bird feeders mounted on poles, the Perky-Pet Metal Pole Baffle attaches to poles, preventing squirrels from being able to climb up. The large cylinder shape is made from resilient metal. Its wide, round design stops squirrels in their tracks when they are making their way up your poles. Efficiently blocking their path to the top where your bird feeder is, this baffle is sure to deter squirrels. Its green color is made to blend in with nature and the habitat of your backyard, making it discrete. The product includes everything you need to mount your baffle successfully. Easy installation is a bonus to this excellent item. It is safe to use around pets and children. It kills other pests too. It comes with an unconditional one-year satisfaction guarantee. The powder is fine for easy application. The Woodlink Audubon Torpedo Steel Squirrel Baffle is a slide on baffle that works by effectively blocking squirrels from climbing up poles and reaching your mounted bird feeders. 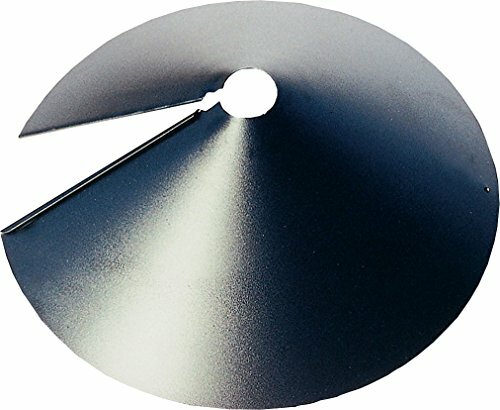 Made from textured powder coated steel, this baffle goes below your bird feeder to work as a deterrent. Squirrels are unable to climb past this torpedo-shaped baffle and will be discouraged from going after your bird seed. All of the hardware you need for installation is included, and the setup is very easy. 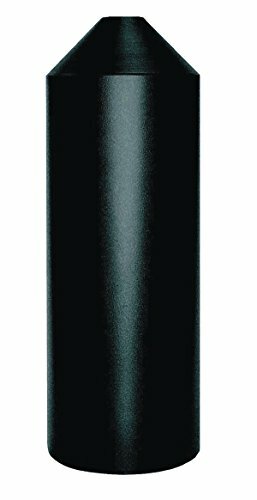 With a sleek design and resistant steel makeup, we believe any bird lover will be happy with this product. Blocks excess sun, rain, etc. If you are going to get protection from squirrels in your yard, it never hurts to go with a product that looks good. 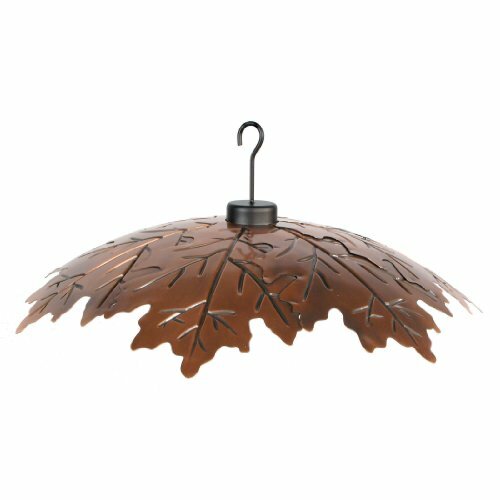 The Woodlink Brushed Copper Shield not only protects your feeder from squirrels jumping on it, but it has a beautiful copper design featuring etched and cut out leaf shapes. This baffle is designed to hang, making it perfect for hanging bird feeders. With a hook already attached to its top, it couldn’t be easier to use. In addition to its squirrel protection, this item also shields your feeder from rain, sun, and other weather elements. This product is great for bird lovers who enjoy a nice view and an artistic touch in their yard. Nothing ruins your perfect backyard setting quite like squirrels. Bird watchers especially tend to loathe these furry rodents that disturb their carefully placed bird feeders. While you wait and watch for the variety of birds to enjoy your feeders, the squirrels are spilling seed, eating the food, and scaring away your feathery friends. After all the hard work you have put into making your yard welcoming to birds, you should be able to enjoy them. Read on to learn some more tips about controlling squirrels and attracting birds. After you have found the right baffle, there are still a few other things you can do to help keep squirrels away from your yard and feeders. First of all, make sure that there are no other food sources to attract the squirrels. If there is food around, you can be sure you will continue to see the squirrels in your yard. This can be spilled bird seed, easily accessible trash, or open gardens. Trees that produce seeds or nuts can attract squirrels, too. While there’s not much you can do about the fruit produced up in the trees; you can do your part by maintaining a clean backyard. Rake up any nuts, berries, seeds, etc. you find in your yard regularly. Don’t be afraid to let your dogs out in the yard. The more often they go out, the less likely you are to have returning squirrels. The squirrels hate the dogs, and the dogs most likely love to chase the squirrels. Sprinkle spicy food in your yard. Squirrels don’t like the taste, and they will stay away from things like black pepper or cayenne pepper. To additionally protect your garden and other plants you may have, consider getting chicken wire or enclosing fences. If you’re a bird-watching novice or a seasoned expert, you can always afford to hear extra tips about attracting birds. There are a few simple things you can do that may help you see more birds visiting your yard and feeders. For starters, it’s important to remember that birds need water as well as food. While this may seem like a no-brainer, it’s not that often that you find bird feeder that includes water. Even if you put out water for the birds, they may not know it is there. We recommend using moving water sources such as drippers, small fountains, or bubblers. The sound will let the birds know that the water is there. Make sure that you are putting out a variety of seed and seed mixes. Different kinds of birds will eat different kinds of seeds, and some birds eat insects. Consider separate feeders for different seeds too to reduce waste. If a bird doesn’t like a certain seed, there is a good chance it will just drop it to the ground where it may never be found. Remember that not all birds like to eat up in the air. There are species of birds that prefer to eat from the ground, such as robins, so it’s a good idea to keep some bird feed down low. Look into buying leaf litter. Leaf little acts as a natural habitat for a lot of insects. The attraction of these insects will attract insect-eating birds.